"Argan" redirects here. For other uses, see Argan (disambiguation). For the genus of moth, see Argania (moth). Argania (Berber: ⴰⵔⴳⴰⵏ Argan) is a genus of flowering plants containing the sole species Argania spinosa, known as argan, a tree endemic to the calcareous semidesert Sous valley of southwestern Morocco and to the region of Tindouf in southwestern Algeria. Argan trees grow to 8–10 m (26–33 ft) high and live up to approximately 200 years. They are thorny, with gnarled trunks and wide spreading crown. The crown has a circumference of about 70 m (230 ft) and the branches lean towards the ground. The leaves are small, 2–4 cm (0.79–1.57 in) long, and oval with a rounded apex. The flowers are small, with five pale yellow-green petals; flowering is in April. The fruit is 2–4 cm (0.79–1.57 in) long and 1.5–3 cm (0.59–1.18 in) broad, with a thick, bitter peel surrounding a sweet-smelling but unpleasantly flavored layer of pulpy pericarp. This surrounds the very hard nut, which contains one (occasionally two or three) small, oil-rich seeds. The fruit takes over a year to mature, ripening in June to July of the following year. The scientific name argania is derived from argan, the name of the tree in Shilha, the Berber language which is spoken by the majority of the people living in the areas where the tree is endemic. Shilha Berber has a rich vocabulary for the various parts of the fruit, its stages of ripeness, and its harvesting and processing. The oil is also called argan. 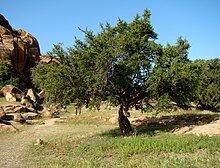 In medieval Arabic pharmacological sources, the tree is known as harjān, a distortion of the Berber word argan. Argan is also grown in the Arabah and Negev regions of Israel. The traditional technique for oil extraction is to grind the roasted seeds to paste, with a little water, in a stone rotary quern. The paste is then squeezed by hand to extract the oil. The extracted paste is still oil-rich and is used as animal feed. Oil produced this way can be stored and used for 3–6 months, and will be produced as needed in a family, from a store of the kernels, which will keep for 20 years unopened. Dry-pressing is becoming increasingly important for oil produced for sale, as this method allows for faster extraction, and the oil produced can be used for 12–18 months after extraction. Argan oil is sold in Morocco as a luxury item. The product is of increasing interest to cosmetics companies in Europe. It used to be difficult to buy the oil outside Morocco, but since 2001–2002, it has become a fashionable product in Europe and North America. It is now widely available in specialist shops and occasionally in supermarkets. Its price (US$40–50 for 500 ml) is notable compared to other oils. Argan trees are a major source of forage for sheep, goats, camels and cattle. Fruits and leaves are readily consumed by livestock. The press cake resulting from oil extraction can also be sun dried and fed to ruminants. Bees can nest in argan trees, making them sites for wild honey harvesting. ^ "Genus: Argania Roem. & Schult". Germplasm Resources Information Network. United States Department of Agriculture. 2009-03-31. Retrieved 2010-12-10. ^ "Argania spinosa". Germplasm Resources Information Network (GRIN). Agricultural Research Service (ARS), United States Department of Agriculture (USDA). Retrieved 2010-12-10. ^ Kouidri, M.; Saadi, A. K.; Noui, A. (2014). "Physicochemical Study and Composition of Argania spinosa Oil from Two Regions of Algeria". Chemistry of Natural Compounds. 50 (2): 346–348. doi:10.1007/s10600-014-0949-1. ^ "Characterization of the argan tree of southwestern Algeria" (PDF). ^ Tim Wall (September 22, 2011). 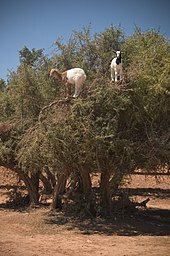 "Tree-Going Goats Threaten Oil Supply_Discovery News". Discovery News. ^ Phenology, breeding system and Fruit development of Argan [ Argania spinosa, Sapotaceae] cultivated in Israel, Avinoam Nerd1, Vered Irijimovich2 and Yosef Mizrahi, Economic Botany, Volume 52, Number 2 / April, 1998, pl 161-167. ^ Delibes, Miguel; el al (2 May 2017). "Tree-climbing goats disperse seeds during rumination". Frontiers in Ecology and the Environment. 15 (4): 222–223. doi:10.1002/fee.1488. ^ Charrouf, Zoubida; Guillaume, Dominique (1999). "Ethnoeconomical, ethnomedical, and phytochemical study of Argania spinosa (L.) Skeels". Journal of Ethnopharmacology. 67 (1): 7–14. doi:10.1016/S0378-8741(98)00228-1. PMID 10616955. ^ Charrouf, Z; Guillaume, D (2007). "Phenols and Polyphenols from Argania spinosa". American Journal of Food Technology. 2 (7): 679. doi:10.3923/ajft.2007.679.683. ^ Khallouki, F; Younos, C; Soulimani, R; Oster, T; Charrouf, Z; Spiegelhalder, B; Bartsch, H; Owen, RW (2003). "Consumption of argan oil (Morocco) with its unique profile of fatty acids, tocopherols, squalene, sterols and phenolic compounds should confer valuable cancer chemopreventive effects". European Journal of Cancer Prevention. 12 (1): 67–75. doi:10.1097/01.cej.0000051106.40692.d3 (inactive 2019-02-16). PMID 12548113. ^ "Arganolie informative (NL)". Archived from the original on September 7, 2013. Retrieved November 5, 2016. ^ Charrouf, Zoubida; Guillaume, Dominique (2008). "Argan oil: Occurrence, composition and impact on human health". European Journal of Lipid Science and Technology. 110 (7): 632. doi:10.1002/ejlt.200700220. ^ Chimi, H; Cillard, J; Cillard, P (1994). "Autoxydation de l'huile d'argan Argania spinosa L. du Maroc" [Autoxidation of argan oil Argania spinoza L. from Morocco]. Sciences des Aliments (in French). 14 (1): 117–24. ISSN 0240-8813. ^ Charrouf, Zoubida; Guillaume, Dominique (2010). "Should the Amazigh Diet (Regular and Moderate Argan-Oil Consumption) have a Beneficial Impact on Human Health?". Critical Reviews in Food Science and Nutrition. 50 (5): 473–7. doi:10.1080/10408390802544520. PMID 20373191. T.J. Lybbert (2007). "Patent Disclosure Requirements and Benefit Sharing: A counterfactual case of Morocco's argan oil". Ecological Economics. 64 (1): 12–18. doi:10.1016/j.ecolecon.2007.06.017. T.J. Lybbert; C.B. Barrett (2004). "Does Resource Commercialization Induce Local Conservation? A Cautionary Tale from Southwestern Morocco". Society & Natural Resources. 17 (5): 413–430. doi:10.1080/08941920490430205. hdl:1813/57696. T.J. Lybbert; C.B. Barrett; H. Najisse (2002). "Market-Based Conservation and Local Benefits: The Case of Argan Oil in Morocco". Ecological Economics. 41 (1): 125–144. doi:10.1016/S0921-8009(02)00020-4. O. M'Hirit; M. Bensyane; F.Benchekroun; S.M. El Yousfi; M. Bendaanoun (1998). L'arganier: une espèce fruitière-forestière à usages multiples. Pierre Mardaga. ISBN 978-2-87009-684-0. J.F. Morton; G.L. Voss (1987). "The argan tree (Argania sideroxylon, Sapotataceae), a desert source of edible oil". Economic Botany. 41 (2): 221–233. doi:10.1007/BF02858970. Rachida Nouaim (2005). L'arganier au Maroc: entre mythes et réalités. Une civilisation née d'un arbreune espèce fruitière-forestière à usages multiples. Paris: L'Harmattan. ISBN 978-2-7475-8453-1. H.D.V. Prendergast; C.C. Walker (1992). 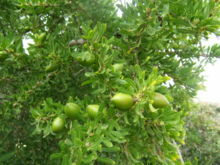 "The argan: multipurpose tree of Morocco". Kew Magazine. 9 (2): 76–85. doi:10.1111/j.1467-8748.1992.tb00072.x. Elaine M. Solowey (2006). Supping at God's table. Thistle Syndicate. pp. 75–76. ISBN 978-0-9785565-1-8. Cristiano, Luigi; De Martino, Gianni (2000). "Marocco atlantico. In terra di Argania". Erboristeria Domani. 233: 78–85. Wikimedia Commons has media related to Argania spinosa. "Argan Foundation". Archived from the original on 3 January 2006. Retrieved January 15, 2006. "Arganeraie". Retrieved January 15, 2006. "Trade and Environment Database: argan oil". Archived from the original on 6 February 2006. Retrieved January 22, 2006. "Biodiversity of South Western Morocco (Flora and Plant Communities of Morocco)". Retrieved October 29, 2006. R. Nouaim; G. Mangin; M. C. Breuil; R. Chaussod (2002). "The argan tree in Marocco: Propagation by seeds, cuttings and in-vitro techniques". Agroforestry Systems. 54 (1): 71–81. doi:10.1023/A:1014236025396. This page was last edited on 10 March 2019, at 19:36 (UTC).